Raleigh, NC is well on its way to becoming one of the South’s next major population hubs. Home to North Carolina State University, a thriving bio-technology cluster, rich cultural offerings, and a relatively low cost of living, it’s no surprise that young and talented workers are flocking to the “City of Oaks.” According to U.S. Census numbers, Wake County’s population grew by 43 percent between 2000 and 2010 — the highest growth of any metropolitan area in the nation for that period — and is projected to increase by 71 percent between 2010 and 2030. 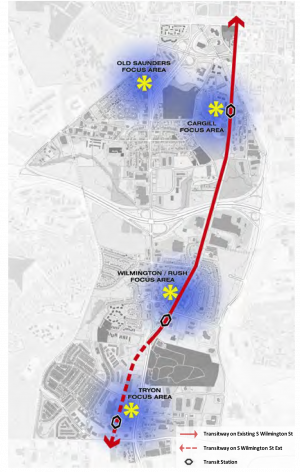 The proposed transit plan would extend and repurpose Southern Gateway’s South Wilmington Street to serve as a major BRT corridor that connects downtown Raleigh to the Town of Garner. To accommodate that rapid population growth and to help more people participate in the economic growth it will likely entail, Raleigh leaders are planning to create a Bus Rapid Transit (BRT) line in Raleigh’s “Southern Gateway.” The BRT will help ease congestion by providing a safe, convenient, affordable alternative to driving, and will help make sure lower-income communities are included in Raleigh’s future economic growth. 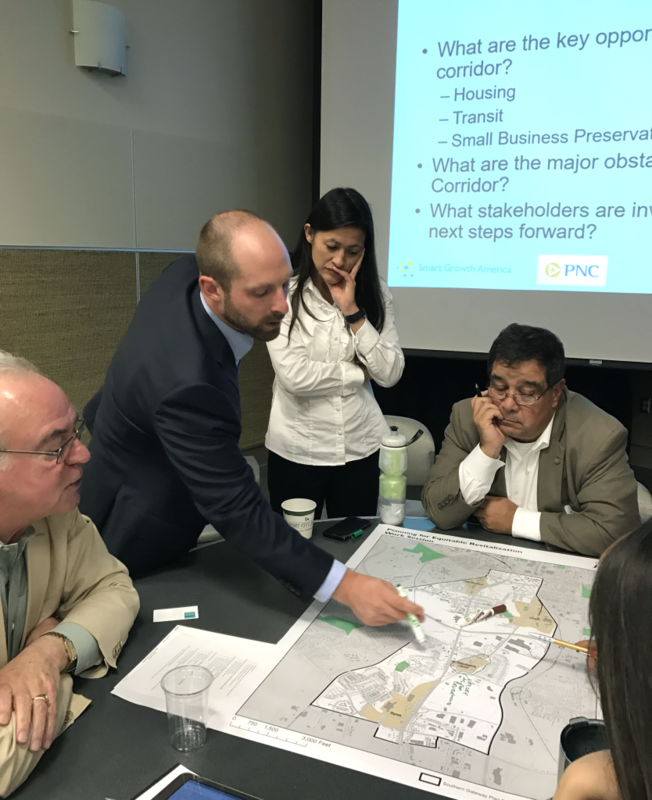 To assist with this work, Smart Growth America traveled to Raleigh in October to convene a Successful and Equitable Revitalization workshop. These workshops, conducted in partnership with PNC Bank, are designed to support and guide communities that are poised for redevelopment and want to ensure that projects are both economically successful and socially equitable. 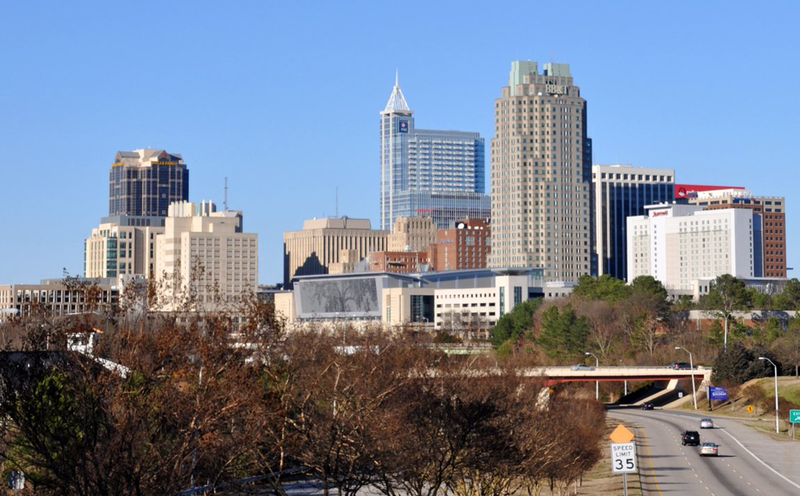 Located just south of downtown Raleigh, the Southern Gateway is formed by major thoroughfares South Saunders Street and South Wilmington Street, offering one of the most picturesque views of Raleigh’s skyline. While downtown and northern Raleigh have enjoyed remarkable growth, the Southern Gateway has witnessed a decline in residents, employment, and economic development. Today, the corridor is home to a high concentration of minority and low- to moderate-income residents who face an array of physical barriers to mobility, including poor pedestrian and bike infrastructure, speeding and cut-through traffic, and unsafe intersections. 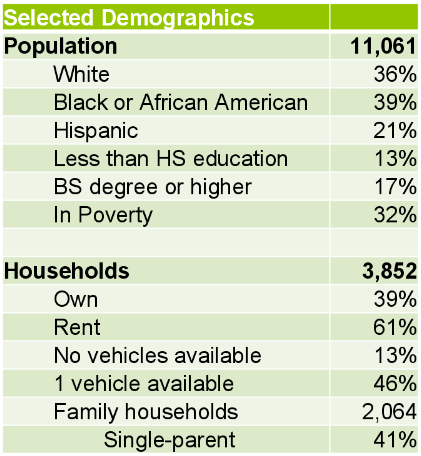 The Southern Gateway is home to a high concentration of low- to moderate-income residents as well as residents of color. Rising rental costs and physical obstructions caused by transit construction can threaten the survival of any small business. The Successful and Equitable Revitalization workshop focused on ways to support existing businesses serving the Southern Gateway communities, while also attracting new, quality investments. One of the proposed station locations, for example, would connect BRT riders from downtown Raleigh to a popular shopping center. Workshop attendees strategized ways to protect these community cornerstones from the potentially negative impacts of BRT — from construction mitigation, community events, small business support programs, to safe and accessible street designs that encourage pedestrian traffic. 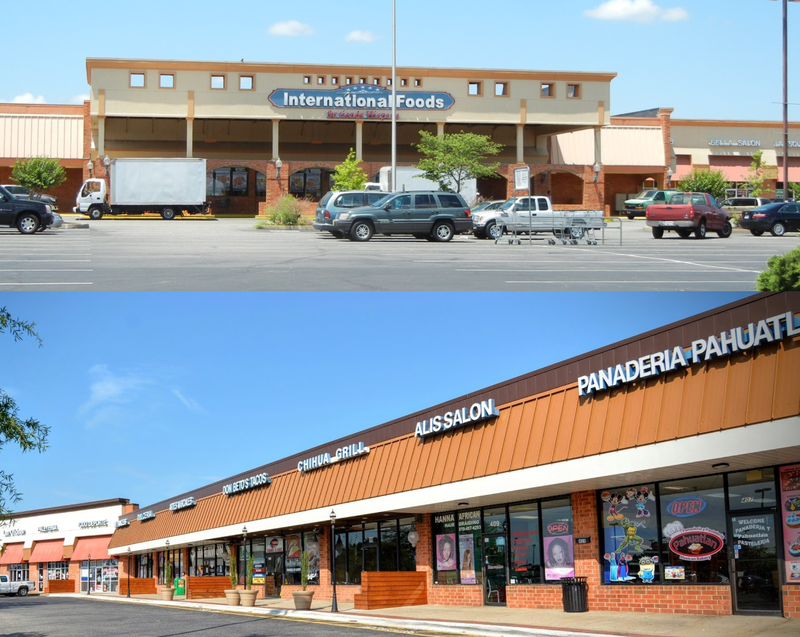 Southern Gateway businesses such as International Food Market and Spanish speaking law offices cater to the communities’ needs. Well before October’s workshop the City of Raleigh hosted numerous public workshops to involve Southern Gateway area residents in the planning process. The Successful and Equitable Revitalization workshop expanded on these efforts by bringing together housing experts, planning professionals, and community advocates to identify potential resources that can be promoted for inclusive growth. Among these strategies included identifying properties that can be acquired before the housing market changes in an effort to generate sites for affordable housing. Smart Growth America’s facilitators also stressed the importance of early and consistent demonstration of public investment in the corridor to boost the confidence of private developers to also do the same. Alex Hutchinson, Economic Development Specialist at Smart Growth America, facilitates a group discussion with community stakeholders. On November 8, Wake County residents voted in support of a half-cent sales tax that will fund the Southern Gateway BRT corridor, along with other transformative improvements to the region’s transit network. The comprehensive proposal integrates a long-term option for commuter rail, increases frequency and hours, and extends bus routes up to 83 miles. Planned service is expected to quadruple transit ridership in the county over the next ten years. The successful ballot measure signals a recognition among Wake County residents that transit investments are an important way to support the region’s quickly growing economy. The BRT corridor has the potential to provide Southern Gateway communities with safe, reliable, and convenient access to jobs, education, and other economic opportunities. However, without the right policies in place, it could also give way to small business displacement and reduce affordable housing supply. With the ballot measure approved and funding for the BRT corridor now secured, the City of Raleigh and Wake County will get to work implementing some of the strategies identified in the workshop to ensure that these new investments will lift workers and families of all income levels.